It is time to take out a bit of the winter garden. This job falls on the chickens. 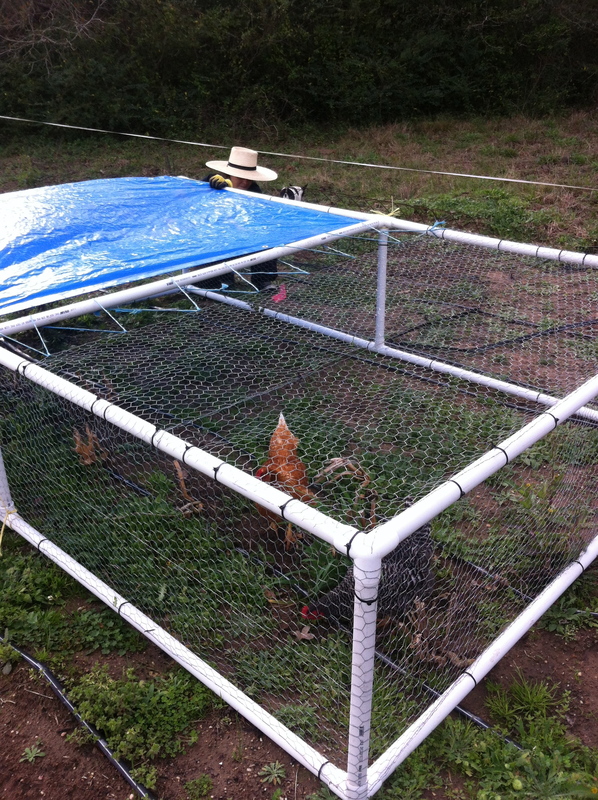 I built a new lightweight chicken tractor out of PVC and chicken wire. I saw a picture of a similar one at the SSAWG conference last month. One hour with 10 chickens and they should have run out of things to eat, so we move it to a new local. Mine is 6′ x 10′ and very easy for one person to move. Now I need to build one the size of my raised beds–4′ wide. I am also building a circular clam-like pen that will go around a fruit tree and fit one or two chickens to weed and debug all of the fruit trees. That job should take about 400 hours.